Been eating far too much lately. We had Amy over for the weekend 2 weeks ago, and we took her out to the China Sichuan for an early bird dinner on Saturday night. At this point, I can't remember the specifics of what we ate - my main course was a lovely white fish, but it was all very nice. They had their front sliding windows open, and it felt lovely and airy. (it was a gorgeous evening after a beautiful hot day).Excellent meal. Plenty of other diners were there, enjoying good food at reasonable prices. Then last Sunday, we decided to use the G-Club card I won at a competition at Taste of Dublin (by giving very honest answers to a Bord Failte questionnaire - basically telling them how awful and overpriced I felt food was when travelling around Ireland. It's true - dinner in hotels is generally quite good, if somewhat pricey, but finding a decent lunch when touring around the country is almost impossible - "homemade" soup out of a pack, burnt bread, flavourless chowder, etc.). With the G Club card, you can get special offers at a number of restaurants - generally 2 for the price of 1 mid-week. It's valid a year, and costs €75, so I'm delighted I got it for free. 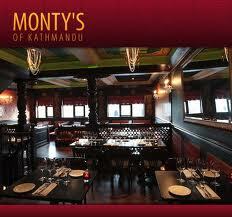 We booked a Sunday evening meal at Montys of Rathgar, a Nepalese restaurant we had never tried before. I had a simple starter of vegetables deep-fried in batter with spices - tasty and mild. Brendan had a potato starter which turned out very hot and quite filling. I ordered a hot, sweet and sour dish with prawns - full of flavour and spice. Halfway through, I swapped with Brendan's milder lamb dish, as mine was getting a bit too spicy for me. The lamb was excellent. Brendan had ordered it hot, but if you avoided the deadly green chillies, it was fine. The meat was excellent, not always guaranteed with lamb, but it was perfectly cooked, and not one gristly bit in sight. Then, though I was already full, I decided to try one of the desserts - made with grated carrots, milk and cinnamon and other spices - the perfect comfort food. Really enjoyed it . Service was good, and the place was packed when we left around 8. Good value with the G-club card, but we could probably have eaten for the same overall cost if we had ordered from the value meal menu, which you can't get with the card. 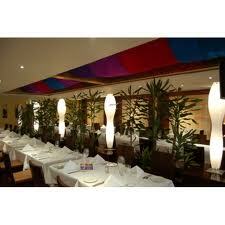 Then, on Wednesday evening, we went to Indian Summer, one of our favourite Indian restaurants. One of Brendan's cousins, Paul, was visiting Ireland with his wife Meg, and we took them for a drive around the Dublin Mountains, with a walk in Powerscourt gardens. It was 6:30 by the time we got back towards Stillorgan, and a good Indian meal was the perfect way to end the day. Again, we ate from the value menu, available all week days, and the food was excellent. And it was packed like we had never seen it before. Clearly the special value/early bird menus are drawing diners back out to all good restaurants. But that's it. No more meals out for me for another few weeks. My digestive system can't take it any more. As I have more space, I've decided to put in some advertising in the side-bar. I hope you don't find it too intrusive. And please do click on the ads, and if you want to buy something, make sure to do it from the link on my blog, or I'll never get any commission! So far, I can't say I've found too many links for products that I like, but there is so much there that I'll have to explore it some more. I've finally moved to one of the new templates - the advantage is that they give you more real estate to express yourself. I do miss the bright green, though. I will probably play around with the various options on offer over the next while. I've only discovered Ben & Jerry's Cookie Dough ice cream recently, on a cinema outing with Susanne. Well, I think it's delicious, and addictive. I've always loved raw dough - I still remember the taste of my granny's waffle dough (I didn't particularly like waffles, but the dough, I could eat by the spoonful). And of course I love the taste of Aine McAteer's chocolate chip cookie dough too. Okajima Dai - he is a friend of one of the sons of my dear friend Shinobu. His music sounds very nice and I wish him a lot of success. (www.okajimadai.com if you want to see his website and if you can read Japanese - you can also use the Google translation tool). This is from his MySpace which I found by clicking at random on the website, then on the blog! After watching Hachi, a dog's tale, we looked into the Akita dog who was the star of the movie. Brendan thought the puppy was absolutely gorgeous, and we found that the dog playing the puppy was actually a Shiba Inu, a smaller breed of Japanese dogs. Both dogs seemed very loyal and intelligent. What the movie didn't show is that the Shiba can be a handful in terms of obedience training, and that the Akita gets bored easily and can become destructive. Both breeds are very intelligent and loyal, but I think better left in the hands of an experienced dog owner. Anyways, the day we get a dog (not for a very long time, as we hope Willow has another 8-10 years to live), it will be from the cats and dogs home. On our way back to the car after our visit to the zoo last Saturday, we walked by the Dublin polo club, and we saw that the horses and their riders were warming up. So we decided to have a closer look, as they started their match. We watched 1 chukka or 2, I'm not sure. I only noticed the bell once, but it felt a lot longer than 7 minutes. Quite an exciting game, when you can hear the sound of the horses' hooves and their quick breathing, as they go back and forth. It's only later, after we looked at the photos that Brendan had taken, that we realised one of the riders was a woman. I guess it's a mixed game. Having Amy with us at the weekend was the perfect excuse for a visit to the zoo. The weather was good on Saturday morning, so we headed out fairly early. After a quick stop at the Point Village big Wheel (more about that another time), we got to the zoo around 11:30, and it was already packed. As the day got sunnier and warmer, it felt like everybody in Dublin was at the zoo, most of them with prams and buggies! But I'm good at elbowing my way to the front of the crowds (good Belgian genes there), so we got to see plenty! The new elephant area is excellent, giving the animals plenty of privacy, but also providing good viewing points for the crowds. And they've moved the giraffes to a nice big patch in the African savanna section, where you can get a good close look at them. Some of the younger giraffes were really gorgeous. Brendan's and Amy's favourite was the red panda, whereas mine was the tiger (the Sumatran tiger, if I remember correctly - we didn't get a picture of it, as he was behind heavy glass panels, so here is a link to the photo on the website. One of them was pacing back and forth really close to where the public was watching. I wonder, could he smell us, and did he think we might make a nice meal! What I liked about the tiger was the fabulous markings on his (or her) face. The red panda was also very active, and kept going over his (or her) territory, and marking it (just like a cat, a little lift of the tail and a shake of the bum). Other highlights for me were the crocodiles (or aligators?) - one of them didn't move at all the whole time we were watching him/her. The 2 pythons in the water were pretty cool, if scary. And the sea lions show was exciting (but very crowded). And the gorillas, the penguins, the chimpanzes, the hornbill, the wolf, the bats, and the bongos (all of which can be found in the alphabetical list). If you want to know more about elephant communication, check out this page. Don't miss the penguin webcam (though right now it's just showing rain falling)! Amy was with us last weekend, and I decided to rent out a video. 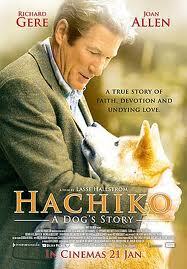 My pick was Hachi, a dog's tale - a movie about the friendship between a man and a dog, with Richard Gere. I thought, "hey, with Richard Gere, I can watch that"! Well, well, little did I know it would be a sad movie (based on a true story), and here I was, half an hour from the end, in floods of tears - about a dog! I must be getting soft! It's a slow and simple movie, but a lovely, if sad, story. PS: I couldn't help adding this lovely picture (not of Richard Gere, but of the dog!). Cute or what? Dublin City Council offer free lunchtime opera in their grounds at Wood Quay every Thursday in August. Opera in the Open, as it is called, is something we've only discovered last week, but apparently, it's been running for years. Last Thursday wasn't the warmest of days, but we decided to head into town anyway, as we had a bit of time on our hands. The opera of the day was Ariodante, by Handel, not one I was familiar with. But I like Handel's sense of rhythm, so I knew we'd enjoy the music anyway. It was colder than I had expected - a lot colder, and I was glad of my fleece and scarf. But one of the singers had a very thin short-sleeved dress, and I felt so sorry for her - despite putting on her coat any time she wasn't on stage, her arms were blue. That didn't stop her from singing beautifully, as they all did. I particularly liked the voice of the pregnant woman who was playing a man's part - which is quite typical in Handel's operas - not the pregnant bit obviously - Some of the parts in Handel's works were originally sung by castrati, a type of voice which cannot be reproduced exactly nowadays, so the castrati parts are sometimes sung by women (mezzo soprano or soprano, I'm not sure), or by countertenors. Not only was it cold, but it was windy, and the page turner for the piano player had a tough time keeping the partition together. At one point, it looked like all the pages were going to fly away, but they were caught in time by the narrator (a very entertaining man, who told us the story at the start of each act - an important role, as there was no sur-titles, and we were only offered excerpts - it all had to fit into a one-hour lunchtime after all.). All in all, a very enjoyable experience. I hope the singers didn't catch colds! It was a while since we'd seen Jean in a new dress - this one a lovely teal blue (I think! ), with a good necklace. I think those strong colours suit her, and I'm glad she's not wearing her boleros any more. If you're in need of cheering up, this is most definitely NOT the book. The Road, by Cormac McCarthy, is, to say the least, bleak. 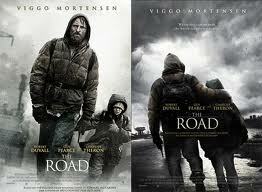 The story of a man and his young son travelling the road south in a post-apocalyptic world. The son was born after the event that changed the world, but we don't know what that event was. And we don't know how so many people died, and why all the trees are burning, and why there are no animals around. It's a world covered in ash, where it's each man for himself, where your survival probably means somebody else will die. But the 2 keep going, in the hope that life might be better further south, by the sea (although there is no actual reason to believe it would be any different down there). And yet, there is love, this amazing bond between father and son. They don't say much, but you know that they have gone through so much together, and that they need each other to keep going. Indeed, how would such a world be bearable if you were on your own? I thought it was excellent. I was really moved by it. No, we didn't go to the Glastonbury festival. Never have and probably never will. But we watched it on the BBC (note that the player can't be watched outside of the UK, for some strange copyright reason). That's a few weeks back now. But we discovered a few bands I had never heard of (Brendan knew a lot more of them than me). Gorillaz, Vampire Weekend, Mumford & Sons are the ones that stand out for me. 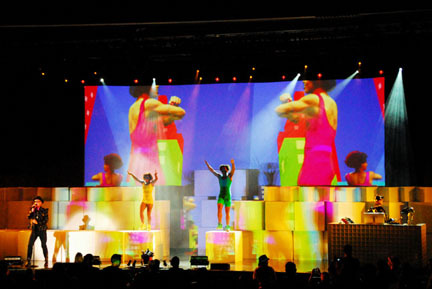 And the Pet Shop Boys show was amazing in its visual and choreographic production. I like the colours in this one better, but the textures are not so good. I'm thinking of calling it "Batman"
I can already count to 20! Today was a gloriously sunny day - at long last. So, the weekend wasn't as productive from a painting point of view, but I did manage 2 abstracts yesterday, as the weather only improved today, after 4 or 5 weeks of dull days. Good student that I am, I went back to exercise #1 and painted the variations suggested under the theme of expressive shapes! Here is Variation #1, which I call "Go". The Watercolorist's Essential Notebook by Gordon MacKenzie contains a lot of useful tips. Things I haven't come across in other books (and I've gone through many over the years), including how to hold your paint brush and how to twist it to vary the thickness of lines. Here are a few of the doodles I produced last weekend with leftover watercolours. I love these rusty colours. I'm not sure how to use these techniques in an actual painting, but they might come in handy for card designs! There are 2 movies based on Philippa Gregory's book The Other Boleyn Girl. I had watched the Hollywood version a few months back. It was good, but it was the BBC version I had heard about, and I was delighted when it was one of my birthday presents this year. It's very atmospheric, not as glamorous, and it absorbed me completely. A perfect complement to the book. I'm trying to catch up on movies and books. This one, Bandits (don't read the last 3 paragraphs of the plot summary - it gives away the whole story), we watched on the telly months ago, but I never got around to writing about it. It's a brilliant movie. It doesn't seem to have done that well at the box office. I don't know why. I think it's excellent. Funny. Tongue-in-cheek. Great action, and plenty of twists. 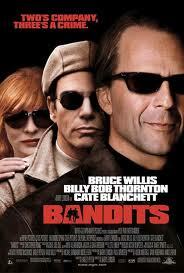 Bruce Willis and Billy Bob Thornton are bank robbers. They abduct Cate Blanchett, a bored and depressed posh housewife. They both fall in love with her and she can't decide. Perfect love triangle. They all go on a bank robbery spree. Can it last forever? It's a while since I've talked about Jean Byrne - it's not that I'm not interested any more! The simple reason is that she's been wearing lovely clothes lately - simple dresses (even the bright yellow one) that flatter her figure, and she's been accessorizing them with simple jewelery. And no little bolero cardigans in sight! The Outlander is Gil Adamson's first novel. The story of a young woman on the run, it's got its ups and downs. It got great reviews, and I can see why - it's a good story, written in beautiful language.And I loved the end (I'll say no more). But I found the story unevenly paced - great speed and suspense in parts, and a slow, settled flow for a large section of it, which didn't appeal to me as much. It's worth the read, certainly, but it didn't quite meet my high expectations after reading the reviews. Despite the explanation in Wikipedia, I don't really get the title of this movie, which Brendan had taped for me recently. 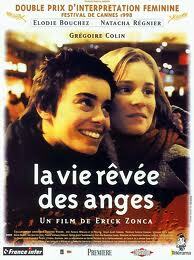 The story of 2 young women in a small town in Northern France, La vie rêvée des anges is very bleak - it always looks cold and grey there, and life is hard. Of the 2, Isa is a happy-go-lucky kind of girl, who finds a positive side to all situations, she treats others well, and she cares for her friends. Marie, on the other hand, is a very troubled young lady - she doesn't seem happy with her lot, she dumps a really nice guy (OK, he's fat, but he is really nice! ), she falls in love with the wrong man, she expects the worst from life, and life generally delivers. And there is a 3rd young woman - Sandrine, who is in a coma. Neither of the other 2 knows her to start with, but they are connected. Isa decides to visit Sandrine in the hospital, whereas Marie has no interest. Not surprising that the 2 actresses got the Best Actress award in Cannes in 1998. Natacha Régnier, who plays Marie, is Belgian by the way. Worth a mention! The forecast for yesterday wasn't great - mind you, the only difference with today was the showers. So we decided to take a drive down to Kildare to check out the Kildare Village outlet centre. (Yes, it would seem that radio advertising works!). I was expecting disappointment. I have this thing about outlet shops since I got a jumper (or was it a scarf?) with a hole in it many many years ago. But it turned out pretty good. It took 45 minutes to get there, it was easy to find, just off the motorway. The car park was fairly quiet when we got there around 12, but there were plenty of parking attendants, who were making sure that no-one parked in disabled spots or loading bays. The place has a bit of a Disneyland feel to it. We decided to have lunch first - in L'Officina (it looks nothing like the picture on their website) - Brendan had the antipasto misto, I had a bruschetta al pomodoro and strawberries and cream for dessert. All perfect and yummy. Now, don't believe the website, listing about half a dozen restaurants - the only 2 places for food and drink in the village are L'Officina and Starbucks. L'Ecrivain and Bentleys are in Dublin city centre, so I have no idea why they are listed as an eating option in Kildare Village! Not that we'd have gone there anyway. The shops are all lined up in a Disney main street, so you can get it all done really quickly if, like me, you skip all the shops that don't interest you (I'm not a great shopper - I have no patience for browsing). There is plenty of choice - Levi's, North Face, LK Bennett, Coast, Monsoon, Clarks, Desigual, Bally, to name but a few, and there are genuine discounts. All shops felt spacious, despite the large crowds descending on the place (mostly young couples, some with babies or young children), and service was generally with a smile (staff at North Face and Desigual get my vote for friendliness). We were all done by 2:30, at which point the car park was nearly full. Recession? What Recession? It's been a very dull July - temperatures haven't been too bad - for Ireland that is - 18-22. But we've had this grey blanket over the sky. It hasn't even rained that much, so we feel like we shouldn't complain, but I'm craving a bit of sunshine. Not great conditions for taking pictures in Airfield, but I did get one good one out of the lot. Whichever way Brendan had set the camera, it produced this lovely blurred background. You will probably find this in my watercolour collection at some point. 3rd and final attempt - I painted this one on a block of Daler Rowney The Langton rough paper (300 g/sqm). The previous attempts were painted on a lighter cold-pressed (fine grain) paper (Canson 200 g/sqm), more suited to precise wet-on-dry painting. The rough paper works better for the grainy textures. That's it. Onwards to the next project! I might frame this one. Attempt #2: Much happier with this one. The door and the small window look 3-dimensional, and the flowers are more vibrant. And the glass panels on the larger window look more convincing with a bit of white in each lower corner. The main weakness is that it is a bit too dark under the large window. More to come! We've been to Lagrasse a few times. It's a lovely little town - quite sleepy. I guess we're there a little bit ahead of the tourist hordes that must descend upon it in the summer. I've based this watercolour on a photograph we took there a few years ago (the light wasn't so good this year). The techniques I've used are inspired by Ann Blockley's Watercolour Textures - she has a section on painting buildings, which really helped me in achieving the effect I was looking for here. 1st attempt - my main problem here is that I forgot all about perspective when I applied wax, so I have some white texture lines at odds with the strong window and kerb lines.